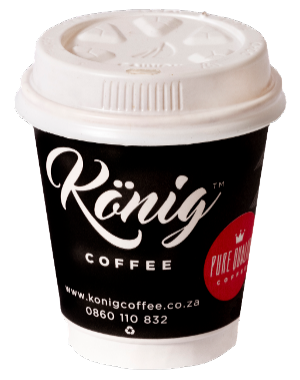 König Coffee (Pty) Ltd with registration number 2004/012816/07 and VAT number 4520216641 is incorporated in the Republic of South Africa and trades as König Coffee. The contents of this site are provided “as is” without warranty of any kind, either expressed or implied, including but not limited to the warranties of fitness for a purpose intended and non-infringement. The owners do not warrant, guarantee or make any representations regarding the safety, reliability, accuracy, correctness or completeness of these contents. The owners shall not be liable for any direct, indirect, general, special, incidental or consequential damages (including -without limitation- data loss, lost revenues and lost profit) which may result from the inability to use or the correct or incorrect use, abuse, or misuse of these contents, even if the owners have been informed of the possibility of such damages. The owners cannot assume any obligation or responsibility. Lead-time is dependent on stock availability. We endeavour to have stock readily available or with short lead times but cannot guarantee that..
Should a product not be in stock we will advise by email, what the scheduled lead time will be and offer an alternative in case the lead time is not feasible or acceptable. Every effort is made to effect shipment of your order timorously however unforeseen circumstances may cause delays. Should we be faced with such an occurrence König Coffee will contact you via email and provide a revised delivery or availability schedule. All prices listed on König Coffee website includes VAT, currently charged at 15%. Goods that are exported outside of the borders of the Republic of South Africa do not carry a VAT charge. Goods shipped to addresses within the borders of South Africa are covered by our all risk insurance policy unless specifically stated differently. Should you wish to use other forms of delivery or your preferred couriers, this can be arranged but will be charged for accordingly. König Coffee can not be held responsible for the failure of any carrier to deliver timorously and within their scheduled times. All Payment in South African Rand (ZAR) and using our available payment methods that can change without notice from time to time as technology changes. Direct Deposit: Al direct deposits, cash or cheques have a standard bank waiting period and no goods will be shipped until such time as the bank clears that deposit to us. Please note that a refund will only be made once the goods have been received back by us, undamaged. You are responsible for the cost of the return, and it is in your own interest to ensure that parcels are insured and that you use a courier that offer a tracking service. König Coffee will not be held responsible for the non-receipt of returned goods. In the unlikely event that any goods are delivered damaged you must advise us within 8 hours of receipt, by email. König Coffee reserve the right to either replace the damaged goods or if this is not possible to refund the purchase price. König Coffee have the right, but not the obligation, to monitor any activity and content associated with the Website. We may investigate any reported violation of these Conditions or complaints and take any action that we deem appropriate (which may include, but is not limited to, issuing warnings, suspending, terminating or attaching conditions to your access and/or removing any materials from the Website). I understand that all the designs and trademarks are registered to König Coffee and hereby accept the terms and conditions. I undertake not to copy/duplicate the trademarks and designs directly or indirectly in anyway and understand the legal implications thereof. Should I be found to be in violation of this agreement, I understand that I will be held liable for all legal costs incurred by König Coffee for any civil action or any legal action deemed necessary against me.